Important note for ipad and other tablet users…the basic model tablets may not have a built in GPS. 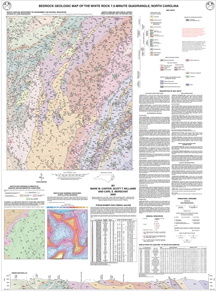 The Bedrock Geology of the Western Portion of the Rocky Mount 100k Quadrangle, Nash, Wilson, and Edgecombe Counties, North Carolina, by Gay, N.K., 2004. Bedrock Geologic Map of the Paint Rock 7.5-minute Quadrangle, North Carolina and Tennessee, by Merschat, C.E., Cattanach, B.L., 2004. Preliminary Bedrock Geologic Map of the Raleigh 30' x 60' Quadrangle, North Carolina, by Clark, T.W., Blake, D. , Stoddard, S., Carpenter, P.A., III, and Carpenter, R.H., 2004. 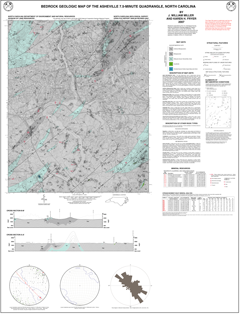 Superseded by OFR 2006-01 Bedrock Geologic Map of the Southeast Portion of the Oxford 7.5-minute Quadrangle, Granville and Vance Counties, North Carolina, by Wooten, R.M., Blake, D.E., Phillips, C.M., Farris, P.F., 2002. 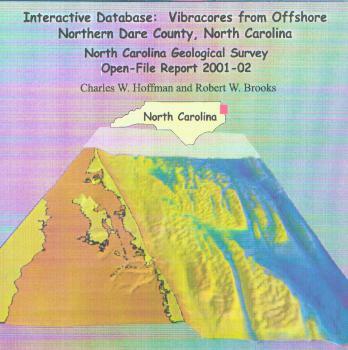 Interactive database: Vibracores from Offshore Northern Dare County, North Carolina, by Hoffman, C.W., and Brooks, R.W., 2001. CD-ROM. 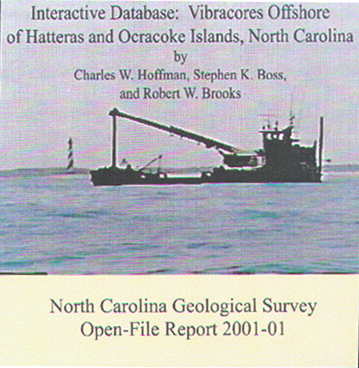 Interactive database: Vibracores Offshore of Hatteras and Ocracoke Islands, North Carolina, by Hoffman, C.W., Boss, S.K., and Brooks, R.W., 2001. CD-ROM. Bedrock Geologic Map of the Sams Gap 7.5-minute quadrangle, North Carolina and Tennessee, by Merschat, C.E., Carter, M.W., and Hewitt, L.K., 2000. 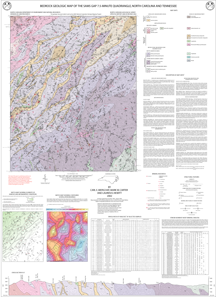 Bedrock Geologic Map of the Asheville 7.5-minute Quadrangle, North Carolina, by Miller, J.W., and Fryer, K.H., 2000, Revised 2007. 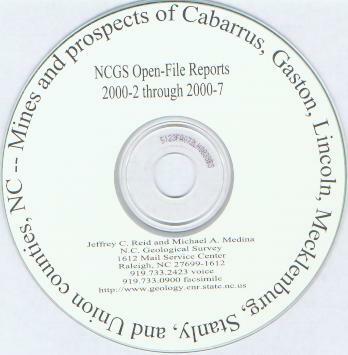 Mines and Prospects of Cabarrus, Gaston, Lincoln, Mecklenburg, Stanly and Union Counties, NC, by Reid, J.C., and Medina, M.A., 2000. CD-ROM. 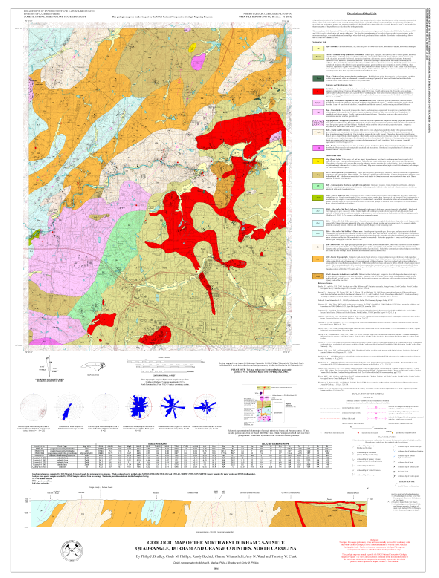 Bedrock Geologic Map of the Erect 7.5-minute Quadrangle, Randolph County, North Carolina, by Carpenter, P.A., III, 1999. 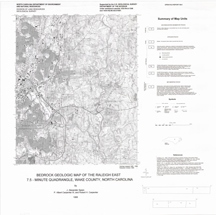 Bedrock Geologic Map of the Raleigh East 7.5-minute Quadrangle, Wake County, North Carolina, by Speer, J.A., Carpenter, P.A., III, and Carpenter, R.H., 1988. 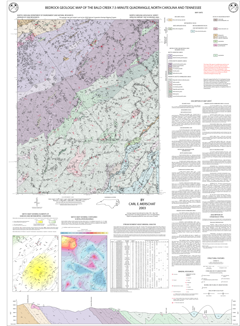 Bedrock Geologic Map of the Clayton 7.5-minute Quadrangle, Wake and Johnston Counties, North Carolina, by Carpenter, P.A., III, Carpenter, R.H., and Speer, J.A., 1998. 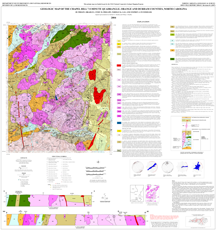 Bedrock Geologic Map of the Flowers 7.5-minute Quadrangle, Johnston County, North Carolina, by Carpenter, P.A., III, Carpenter, R.H., Stoddard, E.F., Huntsman, J.R., and Speer, J.A., 1998. 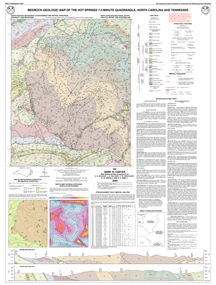 Bedrock Geologic Map of the Selma 7.5-minute Quadrangle, Johnston County, North Carolina, by Carpenter, P.A., III, Carpenter, R.H., Stoddard, E.F., and Huntsman, J.R., 1998. 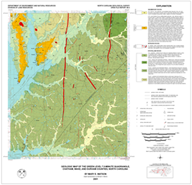 Bedrock Geologic Map of the Bald Creek 7.5-minute Quadrangle, North Carolina and Tennessee, by Merschat, C.E., 1997. Stratigraphic and Heavy-Mineral Data From Continental Shelf Vibracores: Cape Fear Cuspate Foreland Region, North Carolina, by Hoffman, C.W., 1997. CD-ROM. Superconducting Super Collider: Appendix: Petrography and Photomicrographs, by Brown, H.S., 1997. Note: this document was scanned at 600 dpi. Superconducting Super Collider: Location, Geology, and Road Log, by Wilson, W.F., and Carpenter, P.A., III., 1997. Permitted Active and Inactive Mining Operations in North Carolina as of November, 1996, by Reid, J.C., Carpenter, R.H., and Davis, T.E., 1997. Bedrock Geologic Map of the Hot Springs 7.5-minute Quadrangle, North Carolina and Tennessee, Carter, M.W., 1996. 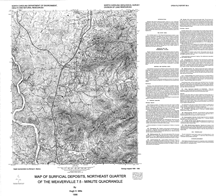 Map of Surficial Deposits, Northeast Quarter of the Weaverville 7.5-minute Quadrangle, by Mills, H.H., 1996. Bedrock Geologic Maps with Fault and Fracture Data for Portions of the Cokesbury and New Hill 7.5-minute Quadrangles, Deep River Triassic basin, Wake County, North Carolina, by Wooten, R.W., Clark, T.W., and Davis, T., 1996. Bedrock Geology of the Zebulon 7.5-minute Quadrangle, Franklin, Johnston, Nash, and Wake Counties, North Carolina, by Carpenter, P.A., III, Carpenter, R.H., Speer, J.A., and Stoddard, E.F., 1996. Bedrock Geology of the Middlesex 7.5-minute Quadrangle, Franklin, Johnston, Nash, and Wilson Counties, North Carolina, by Carpenter, P.A., III, Carpenter, R.H., Speer, J.A., and Stoddard, E.F., 1996. Potential Feldspar Resources in North-central North Carolina, by Carpenter, R.H., Schlanz, J.W., and Carpenter, P.A., III, 1995. Permitted Active and Inactive Mining Operations in North Carolina as of June, 1994, by Reid, J.C., Carpenter, R.H., and Davis, T.E., 1994. 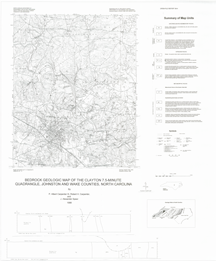 Geology of the Stancils Chapel 7.5-minute Quadrangle, Johnston, Nash, and Wilson Counties, North Carolina, by Carpenter, P.A., III, Carpenter, R.H., Speer, J.A., and Stoddard, E.F., 1994. Report plus 3 oversized plates. Mineralogy of Vibracore Heavy-Mineral Concentrates and Preliminary Stratigraphic Framework of the Southern Inner Continental Shelf of North Carolina, by Nickerson, J.G., Li, Wenfeng, Watson, M.E., and Dentzman, R.C., 1994. Beneficiation Study of Continental Shelf Phosphorites, Onslow Bay, North Carolina, by Crowson, R.A., et al., 1994. North Carolina Outer Banks Beach Nourishment Sand Resources Study, First Interim Report: Shallow, High Resolution Seismic Survey, Offshore Nags Head Area, by Snyder, S.W., 1993. Heavy-mineral Data for Selected Vibracores from the Southern Inner Continental Shelf of North Carolina, by Nickerson, J.G., Li, Wenfeng, and Watson, M.E., 1993. Compilation of Analytical Data for Phosphate-rich Sediments in Onslow Bay, North Carolina, by Riggs, S.R., et al., 1993. Permitted Active and Inactive Mining Operations in North Carolina as of June, 1993, by Reid, J.C., Carpenter, R.H., and Davis, T.E., 1993. Listing of Concentrations of Variables of Stream Sediment, Stream Water, and Groundwater for the Virginia Beach, Currituck Sound, Manteo, and Cape Hatteras 30 x 60 Minute Quadrangles -NURE Database, by Carpenter, R.H., and Reid, J.C., 1993. Listing of Concentrations of Variables of Stream Sediment, Stream Water, and Groundwater for the Morehead City 30 x 60 Minute Quadrangle -NURE Database, by Carpenter, R.H., and Reid, J.C., 1993. Listing of Concentrations of Variables of Stream Sediment, Stream Water, and Groundwater for the Bayboro 30 x 60 Minute Quadrangle -NURE Database, by Carpenter, R.H., and Reid, J.C., 1993. Listing of Concentrations of Variables of Stream Sediment, Stream Water, and Groundwater for the Plymouth 30 x 60 Minute Quadrangle -NURE Database, by Carpenter, R.H., and Reid, J.C., 1993. Listing of Concentrations of Variables of Stream Sediment, Stream Water, and Groundwater for the Norfolk and Elizabeth City 30 x 60 Minute Quadrangles -NURE Database, by Carpenter, R.H., and Reid, J.C., 1993. Listing of Concentrations of Variables of Stream Sediment, Stream Water, and Groundwater for the Wilmington and Cape Fear 30 x 60 Minute Quadrangles -NURE Database, by Carpenter, R.H., and Reid, J.C., 1993. Listing of Concentrations of Variables of Stream Sediment, Stream Water, and Groundwater for the New River 30 x 60 Minute Quadrangle -NURE Database, by Carpenter, R.H., and Reid, J.C., 1993. Listing of Concentrations of Variables of Stream Sediment, Stream Water, and Groundwater for the Kinston 30 x 60 Minute Quadrangle -NURE Database, by Carpenter, R.H., and Reid, J.C., 1993. Listing of Concentrations of Variables of Stream Sediment, Stream Water, and Groundwater for the Rocky Mount 30 x 60 Minute Quadrangle -NURE Database, by Carpenter, R.H., and Reid, J.C., 1993. Listing of Concentrations of Variables of Stream Sediment, Stream Water, and Groundwater for the Emporia and Roanoke Rapids 30 x 60 Minute Quadrangles -NURE Database, by Carpenter, R.H., and Reid, J.C., 1993. Listing of Concentrations of Variables of Stream Sediment, Stream Water, and Groundwater for the Whiteville and Myrtle Beach 30 x 60 Minute Quadrangles -NURE Database, by Carpenter, R.H., and Reid, J.C., 1993. Listing of Concentrations of Variables of Stream Sediment, Stream Water, and Groundwater for the Elizabethtown 30 x 60 Minute Quadrangle -NURE Database, by Carpenter, R.H., and Reid, J.C., 1993. Listing of Concentrations of Variables of Stream Sediment, Stream Water, and Groundwater for the Fayetteville 30 x 60 Minute Quadrangle -NURE Database, by Carpenter, R.H., and Reid, J.C., 1993. Listing of Concentrations of Variables of Stream Sediment, Stream Water, and Groundwater for the Raleigh 30 x 60 Minute Quadrangle -NURE Database, by Carpenter, R.H., and Reid, J.C., 1993. Listing of Concentrations of Variables of Stream Sediment, Stream Water, and Groundwater for the South Boston and Henderson 30 x 60 Minute Quadrangles -NURE Database, by Carpenter, R.H., and Reid, J.C., 1993. Listing of Concentrations of Variables of Stream Sediment, Stream Water, and Groundwater for the Laurinburg and Florence 30 x 60 Minute Quadrangles -NURE Database, by Carpenter, R.H., and Reid, J.C., 1993. Listing of Concentrations of Variables of Stream Sediment, Stream Water, and Groundwater for the Southern Pines 30 x 60 Minute Quadrangle -NURE Database, by Carpenter, R.H., and Reid, J.C., 1993. Listing of Concentrations of Variables of Stream Sediment, Stream Water, and Groundwater for the Chapel Hill 30 x 60 Minute Quadrangle -NURE Database, by Carpenter, R.H., and Reid, J.C., 1993. Listing of Concentrations of Variables of Stream Sediment, Stream Water, and Groundwater for the Danville and Greensboro 30 x 60 Minute Quadrangles -NURE Database, by Carpenter, R.H., and Reid, J.C., 1993. Listing of Concentrations of Variables of Stream Sediment, Stream Water, and Groundwater for the Charlotte 30 x 60 Minute Quadrangle -NURE Database, by Carpenter, R.H., and Reid, J.C., 1993. Listing of Concentrations of Variables of Stream Sediment, Stream Water, and Groundwater for the Salisbury 30 x 60 Minute Quadrangle -NURE Database, by Carpenter, R.H., and Reid, J.C., 1993. Listing of Concentrations of Variables of Stream Sediment, Stream Water, and Groundwater for the Galax and Winston-Salem 30 x 60 Minute Quadrangles -NURE Database, by Carpenter, R.H., and Reid, J.C., 1993. Listing of Concentrations of Variables of Stream Sediment, Stream Water, and Groundwater for the Gastonia 30 x 60 Minute Quadrangles-NURE Database, by Carpenter, R.H., and Reid, J.C., 1993. Listing of Concentrations of Variables of Stream Sediment, Stream Water, and Groundwater for the Hickory 30 x 60 Minute Quadrangle -NURE Database, by Carpenter, R.H., and Reid, J.C., 1993. Listing of Concentrations of Variables of Stream Sediment, Stream Water, and Groundwater for the Wytheville and Boone 30 x 60 Minute Quadrangles -NURE Database, by Carpenter, R.H., and Reid, J.C., 1993. Listing of Concentrations of Variables of Stream Sediment, Stream Water, and Groundwater for the Hendersonville 30 x 60 Minute Quadrangle -NURE Database, by Carpenter, R.H., and Reid, J.C., 1993. Listing of Concentrations of Variables of Stream Sediment, Stream Water, and Groundwater for the Asheville 30 x 60 Minute Quadrangle -NURE Database, by Carpenter, R.H., and Reid, J.C., 1993. Listing of Concentrations of Variables of Stream Sediment, Stream Water, and Groundwater for the Johnson City 30 x 60 Minute Quadrangle -NURE Database, by Carpenter, R.H., and Reid, J.C., 1993. Listing of Concentrations of Variables of Stream Sediment, Stream Water, and Groundwater for the Fontana Lake and Toccoa 30 x 60 Minute Quadrangles -NURE Database, by Carpenter, R.H., and Reid, J.C., 1993. Listing of Concentrations of Variables of Stream Sediment, Stream Water, and Groundwater for the Knoxville 30 x 60 Minute Quadrangle -NURE Database, by Carpenter, R.H., and Reid, J.C., 1993. Listing of Concentrations of Variables of Stream Sediment, Stream Water, and Groundwater for the Cleveland and Dalton 30 x 60 Minute Quadrangles -NURE Database, by Carpenter, R.H., and Reid, J.C., 1993. Listing of Concentrations of (Groundwater and Stream Water) of Variables Which Equal or Exceed the 90th Percentile, and pH and Conductivity Below the 10th Percentile in the North Carolina Portion of the NURE Database, by Reid, J.C., and Carpenter, R.H., 1993. Listing of Conccentrations (Stream Sediments) of Variables Which Equal or Exceed the 90th Percentile, and pH and Conductivity Below the 10th Percentile in the North Carolina Portion of the NURE Database, by Reid, J.C., and Carpenter, R.H., 1993. 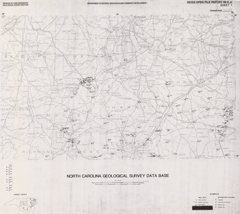 Mica: a Listing of North Carolina Geological Survey Mica Mine Files and a Discussion of the Mineral, by Ballew, Sigrid, 1992. Permitted Active and Inactive Mining Operations in North Carolina as of May 1992, by Reid, J.C., and Davis, T., 1992. Stratigraphic Framework and Heavy-Mineral Resource Potential of the Inner Continental Shelf, Cape Fear Area, North Carolina: First Interim Progress Report, by Hoffman, C.W., Gallagher, P.E., and Zarra, Larry, 1991. Permitted Active and Inactive Mining Operations in North Carolina as of May 1991, by Reid, J.C., and Davis, T., 1991. The Dummitt-Palmer #1 Coal-Bed Methane Test Well, Lee County, North Carolina, by Hoffman, C.W., and Beutel, R. A., 1991. 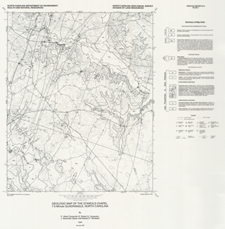 Bedrock Geology and Mineral Resources of the Powhatan 7.5-minute Quadrangle, Johnston County, North Carolina, by Carpenter, P.A., III, 1990. Geologic Map of Sedimentary Deposits along the Fall Zone of Northhampton, Halifax, Nash, and Wilson Counties, North Carolina, by Gallagher P.E., and Hoffman, C.W., 1990. Scale = 1:125,000. Geology and Heavy-Mineral Exploration of Sedimentary Deposits along the Fall Zone of Northampton, Halifax, Nash, and Wilson Counties, North Carolina, by Gallagher P.E., and Hoffman, C.W., 1990. Heavy-Mineral Resource Potential of Surficial Sediments on the Atlantic Continental Shelf of NC, by Grosz, A. E., et al., 1990. Alphabetical Listing of Theses and Dissertations on North Carolina Geology, Compiled by Walton, R.O., III, 1990. (Revised 6/92, 4/95). Review of Seismic Reflection Data from the NC Coastal Plain and adjacent Continental Shelf, by Zarra, Larry, 1990. Sequence Stratigraphy and Foraminiferal Biostratigraphy for Selected Wells in the Albemarle Embayment, North Carolina, by Zarra, Larry, 1990. PDF text, plus 3 PDF oversized plates in one Zip Archive. The MINERAL INDUSTRY of North Carolina in 1988, by U.S. Bureau of Mines, 1989. 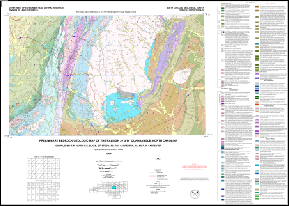 Superceded by NCGS Bulletin 92 Geologic Map of the SOUTHWEST DURHAM 7.5-Minute Quadrangle, North Carolina, by Hoffman, C.W., and Gallagher, P.E., 1989. 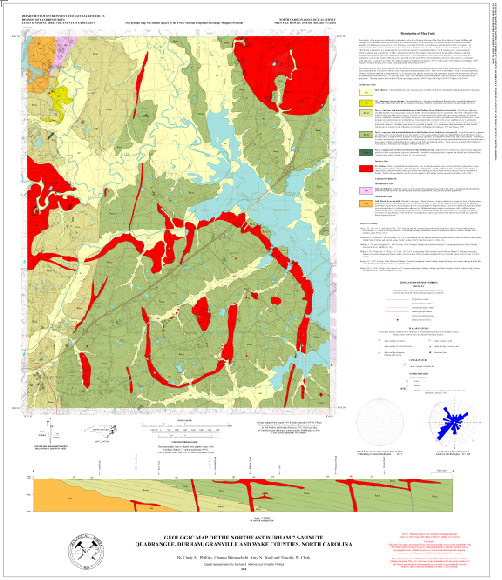 Superceded by NCGS Bulletin 92 Geologic Map of the SOUTHEAST DURHAM 7.5-Minute Quadrangle, North Carolina, by Hoffman, C.W., and Gallagher, P.E., 1989. 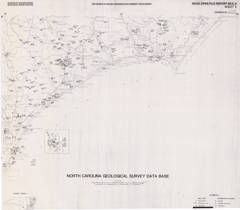 North Carolina Geological Survey Database Maps- Sheet 6: Eastville and Manteo Quadrangle by Nickerson, J.G., and Hoffman, C.W., 1988. This publication, last updated 06/20/1995, has been superceded by digital databases. This drill hole dataset is available upon request. 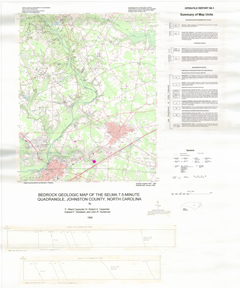 North Carolina Geological Survey Database Maps- Sheet 5: Beaufort 1° x 2° Quadrangle by Nickerson, J.G., and Hoffman, C.W., 1988. 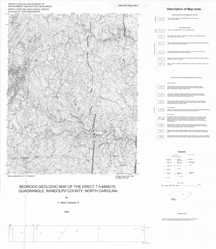 North Carolina Geological Survey Database Maps- Sheet 4: Rocky Mount 1° x 2° Quadrangle by Nickerson, J.G., and Hoffman, C.W., 1988. 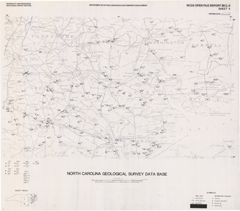 North Carolina Geological Survey Database Maps- Sheet 3: Norfolk 1° x 2° Quadrangle by Nickerson, J.G., and Hoffman, C.W., 1988. 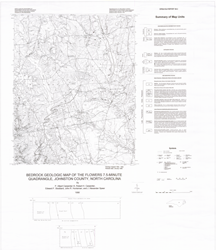 North Carolina Geological Survey Database Maps- Sheet 2: Florence 1° x 2° Quadrangle by Nickerson, J.G., and Hoffman, C.W., 1988. 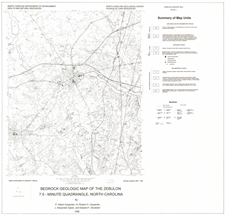 North Carolina Geological Survey Database Maps- Sheet 1: Raleigh 1° x 2° Quadrangle by Nickerson, J.G., and Hoffman, C.W., 1988. North Carolina Geological Survey Sample Repository of Core, Cuttings, and Well Logs, by Hoffman, C.W., and Nickerson, J.G., 1988. Lithostratigraphic-Seismic Evaluation of Hydrocarbon Potential, North Carolina Coastal and Continental Margins, by Almy, C.C., Jr., 1987. Residual Bouguer Gravity Map of North Carolina and Vicinity, by Black, W.W., 1987. 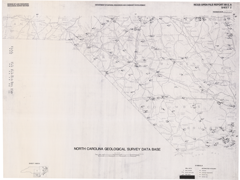 Simple Bouguer Gravity Map of North Carolina and Vicinity, by Black, W.W., 1987. Geologic Map of REGION J - Chatham, Durham, Johnston, Lee, Orange, and Wake Counties, North Carolina, 1:125,000-scale by Wilson, W.F., Carpenter, P.A., III, and Parker, J.M. III, 1981. Geologic Map of REGION H (Anson, Montgomery, Moore, & Richmond Counties) (incl text) 1:125,000, by Burt, E.R., 1981. 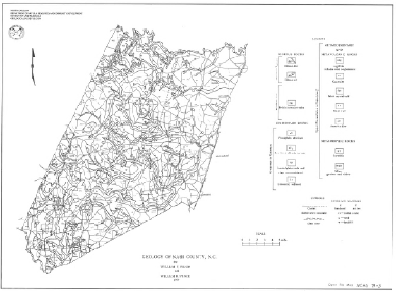 Geology and Land Use, HALIFAX Co, Including Geologic Map of Halifax Co (incl text) 1:125,000, by Wilson, W.F., 1981. 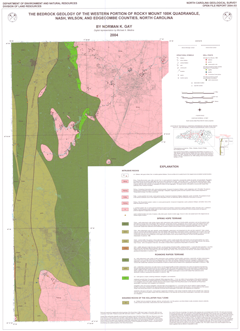 Geology & Land Use, CHATHAM Co, Including Geologic Map of Chatham County (incl text) 1:125,000, by Wilson, W.F., and Carpenter, P.A., III, 1981. Geology and Mineral Resources of Orange County, North Carolina, by Allen, E.P., and Wilson, W.F., 1981. Clays and Shales of the North Carolina Piedmont (includes map and text) , by Allen, E.P., and Liles, K.K., 1980. 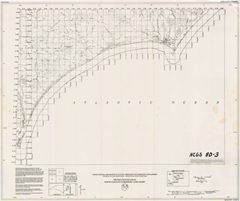 Protraction Diagram: North Carolina Submerged Land Leases, Manteo, Beaufort, and Georgetown 1 x 2 degree sheets, by The North Carolina Geological Survey, 1980. Geologic Map of REGION K (Franklin, Granville, Person, Vance, & Warren Co) including text, 1:125,000, by McDaniel, Ron, 1980. North Carolina's Bay Lakes, the "Carolina Bays": an Update on Their Origin and Character (draft) by Beyer, F.L., 1980. 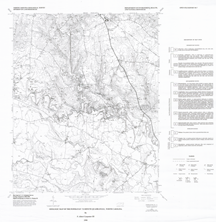 Geologic Map of NASH County, Scale 1:125,000, by Wilson, W.F., and Spence, P., 1979. 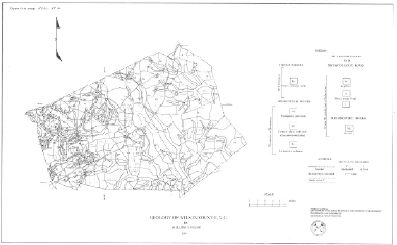 Geology of WILSON County, 1:125,000, by Wilson, W.F., 1979. Geological and Geophysical Evaluation of the Graingers Basin for Triassic Sediments, by Sampair, J.L., 1979. 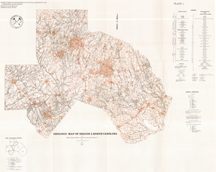 Roadless Area Review and Evaluation (RARE II): Mineral Resources , by Wiener, L.S., 1978. Geologic Aspects of the Nolichucky River Area, Huntdale, NC, to Chestoa TN, by Wiener, L.S., 1976. Preliminary Geologic Report of the Green River , by Merschat, C.E., and Wiener, L.S., 1975. Soil Characteristics of the Lithologic Units of Wake County, by Anderson, M.B., and Campbell, W.D. III, 1973. 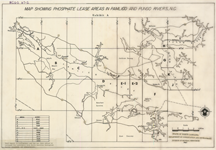 Map Showing Phosphate Lease Areas in Pamlico and Pungo River, North Carolina , by NC Division of Mineral Resources, 1973, 3 Plates. The Geology of the Cliffs of the Neuse State Park and its Surrounding Area, by Ferenczi, Istvan, 1958. The Geology of the William B Umstead State Park, by Fortson, C.W., 1958. Geologic Map of the Northern One-half of the Chapel Hill, North Carolina, Quadrangle, by Kirstein, D.S., 1954. War Minerals Report - Hamme Tungsten District, Vance County, N.C., Final Report - Project 753, by The United States Department of the Interior, Bureau of Mines, College Park, Maryland, 1944. Report on the development of Industries in North Carolina (The Brassert Report, 1943), by Brassert, H.A., and Company, 1943.